Rick Platt: So Who Owns The Tunnel? So Who Owns The Tunnel? 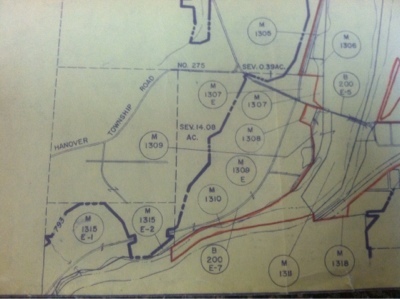 A while back, I showed the deed of one of the Rock Haven Park lot owners near Blackhand Gorge. One would, naturally, assume the subdivision owns the tunnel, but the deed clearly says they don't. It could be a bad deed document. That is one possibility. It could be the County owns it. 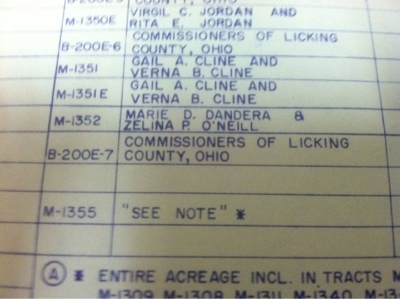 There's also compelling evidence the State ODNR owns it. Here's a photo of one Army Corps map from 1958. It says the County owns it and implies the Army Corps of Engineers may have acquired it. Looks like a title search followed by an update to someone's deed and to the tax map is in order. Stay tuned. The tunnel is under M 1315 E-2.